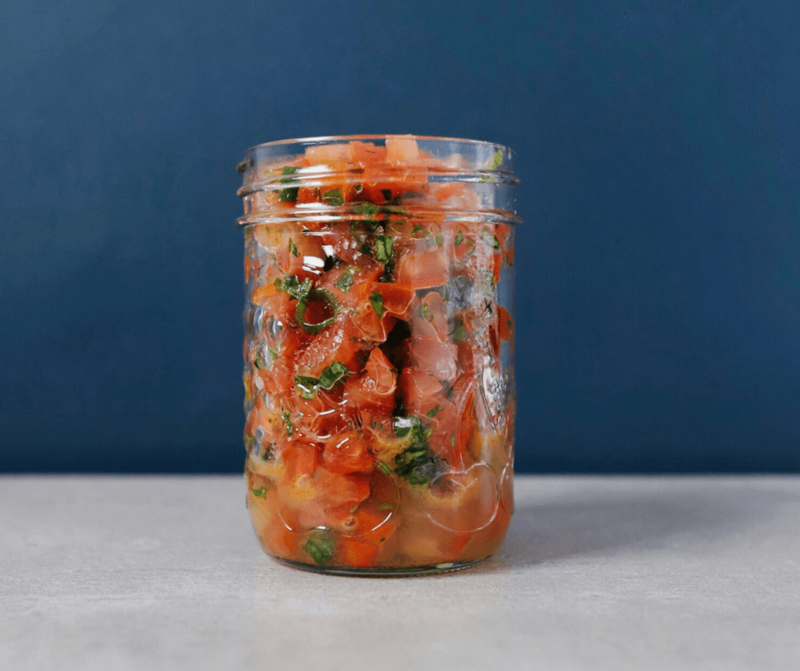 Think following the low FODMAP Diet means salsa is gone from your life for good? Think again, my friend. 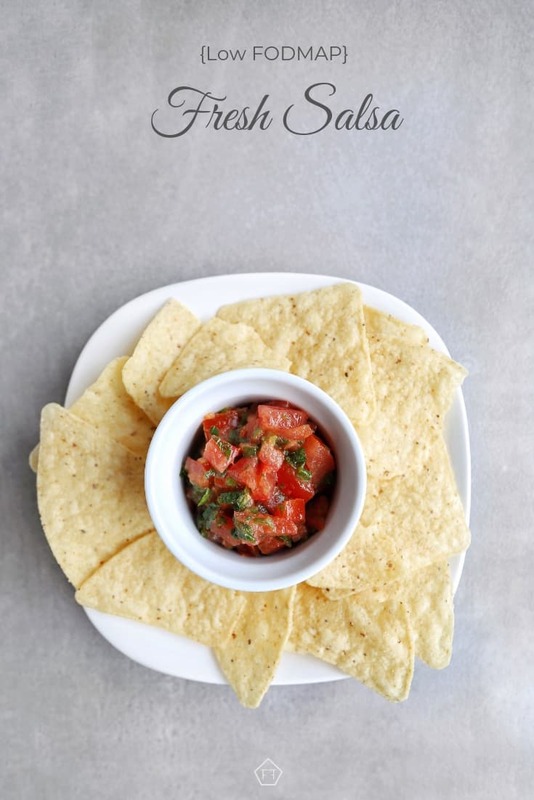 With a few easy tweaks, you can make your own low FODMAP salsa, just in time for the big game. So grab your gang and get the party started. This low FODMAP salsa tastes like the real deal. Made with fresh ingredients and a little pizzaz, this salsa is a game changer. Whether you whip it up for family nacho night or the next big game, you won’t be disappointed. Think this low FODMAP salsa sounds great, but you don’t have time to try it now? You can PIN THIS POST for later. 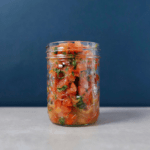 No matter how you use it, this low FODMAP salsa is going to steal the show. Check out the notes below for tips on keeping this recipe low FODMAP. First up, tomatoes. According to Monash University, common tomatoes don’t have any detectable FODMAPs. So. you can eat as many as you’d like without adding to your FODMAP load. To get the tell-tale onion flavour, this recipe also uses green onions. According to Monash University, the tops of a green onion don’t have any FODMAPs. 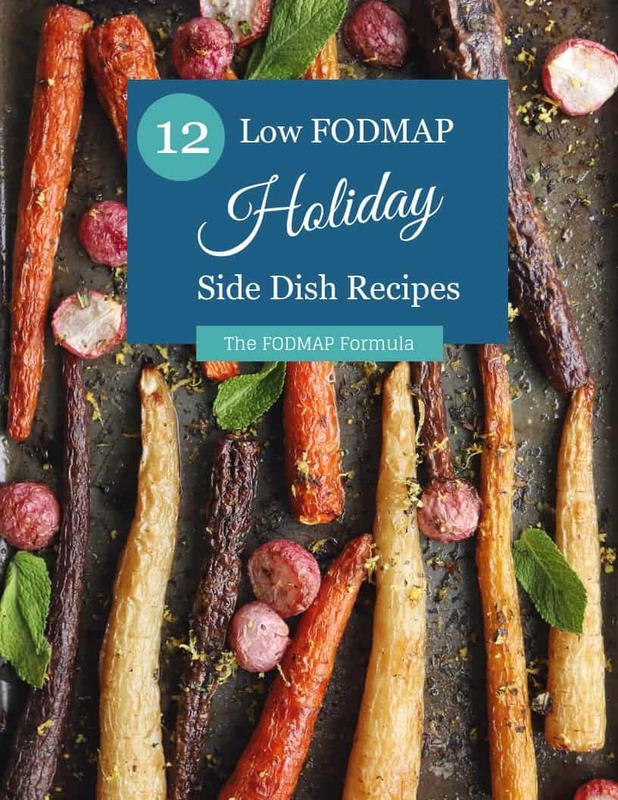 This means you can tweak the recipe to your taste without increasing your FODMAP load. Last but not least, lemons juice. 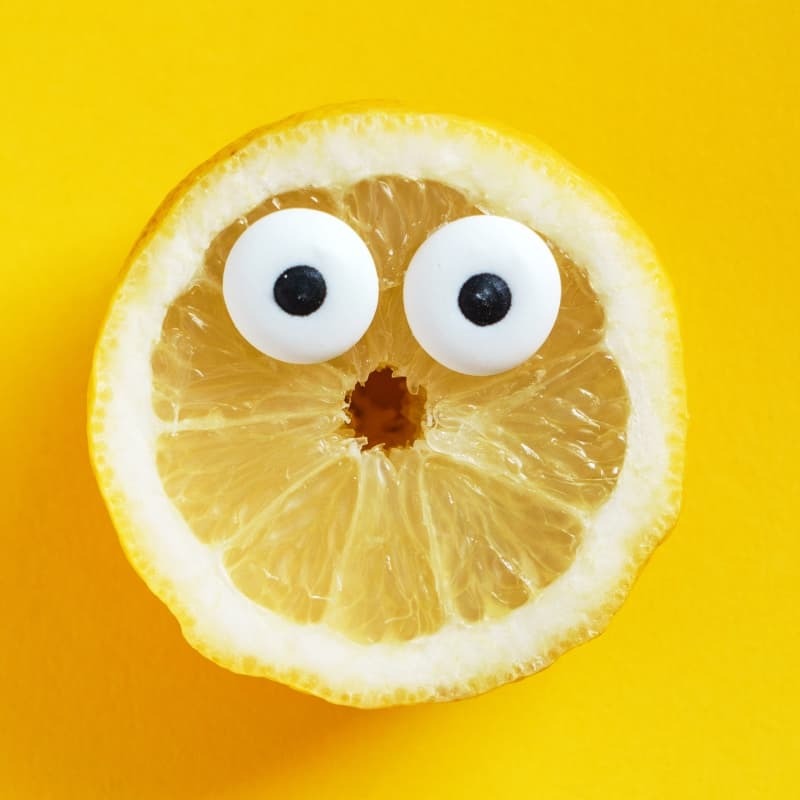 Lemon juice is low FODMAP in servings of 1/2 a cup per sitting. Servings of 3/4 cups or more are high in the FODMAP fructan. This recipe uses 2 tbsp total, which works out to 0.04 of a serving of fructans per sitting. Just so you know, this recipe tastes the best when the flavours have had a few hours to commingle. If you need your salsa ASAP, swap the olive oil for onion infused oil to give the flavours a little boost. Otherwise, make sure to let your salsa sit in the fridge for at least two hours. This low FODMAP salsa is great with gluten-free corn chips or cucumber rounds. You can also try it on my fully loaded nachos or in this awesome low FODMAP enchilada recipe. 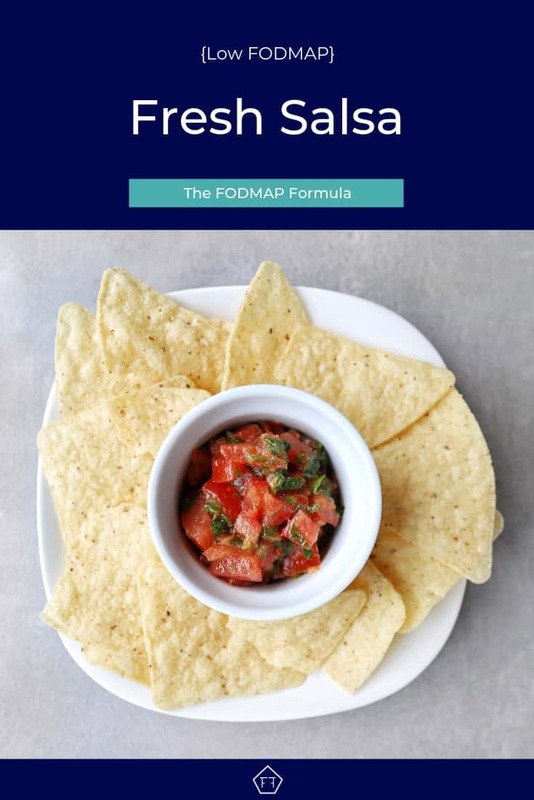 Want to try this low FODMAP salsa? Don’t forget to PIN THIS RECIPE for later. 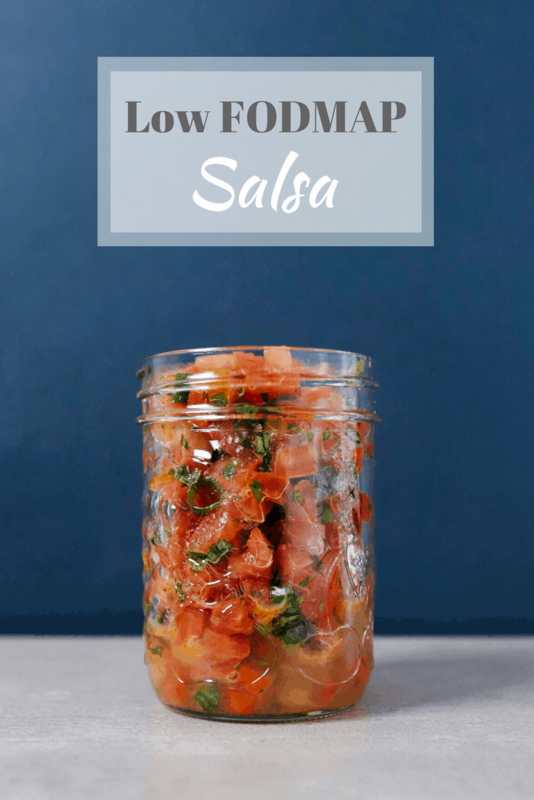 Whether you're looking for something to serve on game day or just a healthy snack, this low FODMAP salsa is sure to please. Made with fresh ingredients and a little pizzaz, this recipe will steal the show! Place all ingredients in an airtight container. Shake well and refrigerate for at least 2 hours before serving. Keeps for 2 days. This low FODMAP salsa will be the MVP on game day. If you like this recipe, sign up for my mailing list below. You’ll get new recipes and articles delivered right to your inbox. Want more inspiration for the big game? Follow me on Pinterest for even more low FODMAP ideas. Together we’ll get the Low FODMAP Diet down to a science!